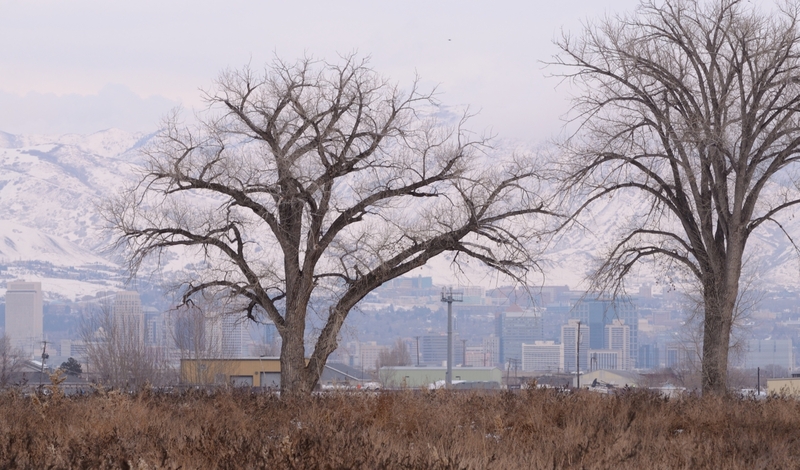 This past weekend we visited Salt Lake City. I had some free time so I stopped by a store I've seen from I-15 the past few times I've driven that route. Now there are a lot of stores along I-15 so why did this one stand out? Two reasons. Its massive scale and its name. This store appeared to be the size of a coliseum with two huge glass facades. It's called Scheel's, and I had never heard of it. I used to work as a credit analyst with a focus on retail so I tend to keep an eye on what is going on in that space. So when a retailer with a funny sounding name I've never heard of plops a 200,000 square foot store along a major highway, it piques my curiosity. 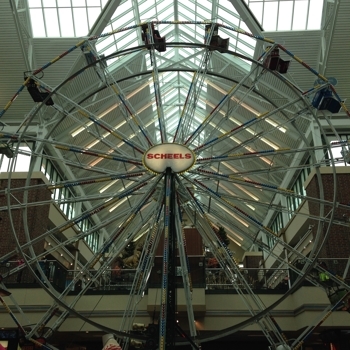 I walked into the store, past the cash registers and was greeted not by a barrage of merchandise but by a 65-foot Ferris wheel. Children and their parents waited in line for their turn to ride. In the alcoves on the first floor, there was sportswear for sale but the star attraction was the Ferris wheel. I took the escalator upstairs, walked past the golf clubs, a row of exercise machines, a bowling alley and found a taxidermy mountain. 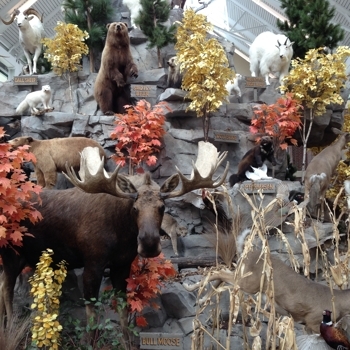 The fake hill was littered with stuffed wildlife ‒ bears, antelope, grouse, turkeys, mountain lions, mountain goats, deer, bald eagles and a moose. A speaker blasted out animal sounds. On one side of the taxidermy mountain was the Ferris wheel and on the other there was a full-size seaplane hanging from the ceiling. Below the seaplane there were kayaks and paddleboards for sale. Next to that was the gun and ammo section. 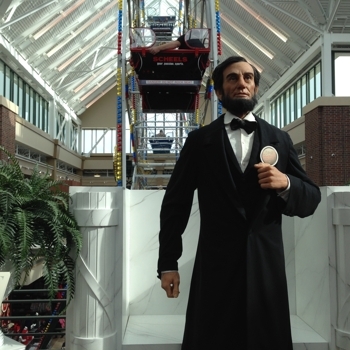 I continued walking to get a better view of the Ferris wheel and was greeted by a life-size talking Abe Lincoln sharing a message of freedom. His closest neighbor was a stuffed (and silent ) grizzly bear, next to which was the fish and tackle section. At that point, I passed a fake monster truck that is used for photo ops, went down the escalator and fled. Retail is an incredibly competitive business so I admire anyone that has the capital and gumption to risk millions of dollars to create a circus-like atmosphere housed in a beautiful brick and glass building. This is not Scheel's first store modeled in this fashion so the formula must be working. What is disheartening is that the formula does work. The bigger the retail spectacle, the bigger the crowds. We visited some distance relatives in the Netherlands last year and one of the things that fascinated them about their family trip to America a decade ago was the size of the grocery carts. What would they say if they saw the size and kitschiness of U.S. sporting goods stores? In 2007, Jame Gilmore and Joseph Pine suggested in their book Authenticity: What Consumers Really Want is in fact that: authenticity, genuineness, realness. But the hodge-podge of displays at Scheel's is anything but real. Ironically, though, they are selling equipment and goods used to experience the authenticity of nature. Or at least to conquer it, stuff it and hang it on the wall. Nature is the original Supreme Good, something inherently good for its own sake. Does hunting and fishing relegate it to a second order good? Nature exploited to achieve a different aim? Not necessarily. Those that hunt and fish are some of the staunchest conservationists I know. Their efforts to form conservation groups, lobby politicians and exemplify good stewardship have helped preserve and protect acre upon acre of wilderness from encroachment. For many, the act of hunting and fishing is secondary to the simple joy of experiencing nature as a Supreme Good. The question is whether valuing nature as a Supreme Good is compatible with buying outdoor supplies at a store with a talking Abe Lincoln standing in front of a Ferris wheel. According to Wikipedia, Scheel's started in 1902 as a small hardware and general merchandise store in Sabin, Minnesota. 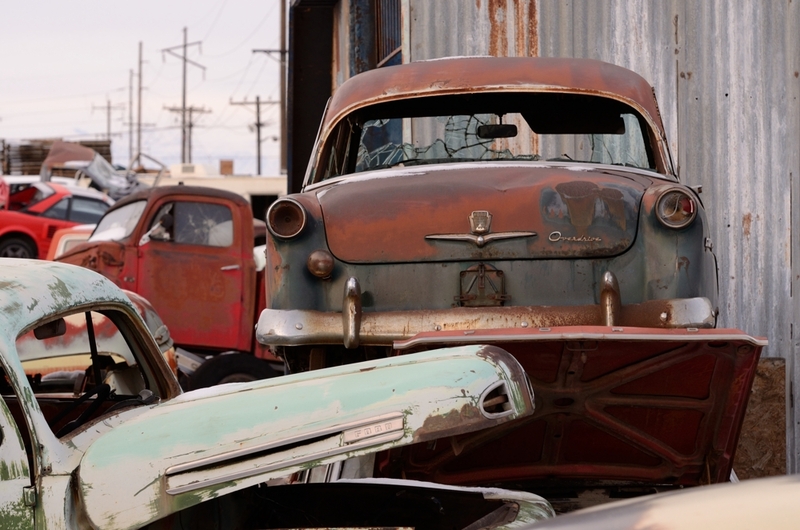 It added sporting goods in 1954. It opened its first all sports superstore in 1989. It is now constructing a new 222,000 flagship store in Overland Park, Kansas complete with a 16,000-gallon aquarium, coral reef and scuba divers to feed the fish daily, a 65-foot, 16-car Ferris wheel and a walk of U.S. presidents. This would appear to be the retail version of jumping the shark. Expanding to the point of absurdity. Yet, the format appears to works. Not for me, but for many as evidenced by the packed parking lot. I wonder how many shoppers were return visitors? Once the novelty wears off, why wouldn't they buy outdoor supplies online so they could have more time to experience the authenticity of nature? Or if they want an authentic shopping experience, why not visit a small fly shop or outfitter where they could have a genuine conversation with the owner about the local habitat? "We are hunters; we are only truly alive in those moments when we improvise; no schedule, just small surprises and stimuli from the environment."